Last week, Apple recently updated its line of top MacBook Pro 13 and macbook pro 15 with the Touch Bar with more qualified specifications. Both laptops berbanderol prices starting from 1799 US dollars (USD 25.9 million). Both are also claimed to be “the fastest MacBook Apple ever made”. Is that right? 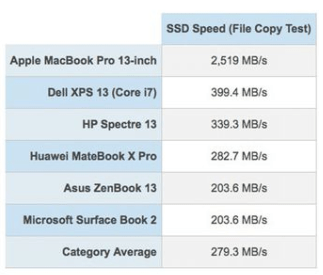 The Mag Laptop site runs benchmarks on the new 13-inch MacBook Pro (Core i7, 16GB RAM, 512 GB SSD) and finds that the laptop is indeed really speeding, especially for SSD speed. SSD (Solid State Disk) storage media on the new 13-inch MacBook Pro, capable of breaking speeds of 2,500 Megabytes per second in a test copy file. A file of 4.9 Gigabyte can be copied in just two seconds. When tested again with BlackMagic Disk Speed ​​benchmark, write speed (write speed) SSD latest MacBook Pro 13-inch reaches the range of 2600 megabytes per second. Average laptops in the premium class like the MacBook Pro 13-inch record 279 megabytes per second. In addition to SSD, Apple also updated the hardware MacBook Pro 13 inch and 15 inch with Touch Bar feature. Both laptop processors are now using Intel Core i5, Core i7, or Core i9 eighth generation. Apple also buried a new mechanism to protect the Butterfly keyboard on both laptops, so the buttons are not too easy to jam when dust enter, although overall this keyboard has not changed much. Only 13-inch and 15-inch MacBook Pro with Touch Bar are updated. 13-inch MacBook Pro non-touchbar, 12-inch MacBook, and MacBook Air line did not get a hardware update.